A beautiful stacked stone wall defines the garden and incorporates a water feature while allowing views of the land beyond. We tend to think of garden walls and fences as utilitarian – simply a means of defining a space, marking a property boundary or holding back soil. Yet they can be so much more than that. I had the opportunity to visit this Seattle area garden in 2007 and its exceptional design has kept me returning to this image for inspiration time and again. Small spaces are challenging to design not least of all because we often need them to serve several different functions – dining, sitting, edible gardening, children’s play space etc. Trying to include all these elements and allowing each space to have its own personality while maintaining an overall cohesive look is not easy. A narrow gas fireplace is cleverly incorporated into the wall design. The clean geometric style is perfect in this space. Here the talented designer has created two distinct patios separated by an adventurous pathway which crosses a shallow water feature. In addition, the patio in the foreground has its own unique fireplace. What holds all these elements together and gives this small garden such a wonderful feel of openness? 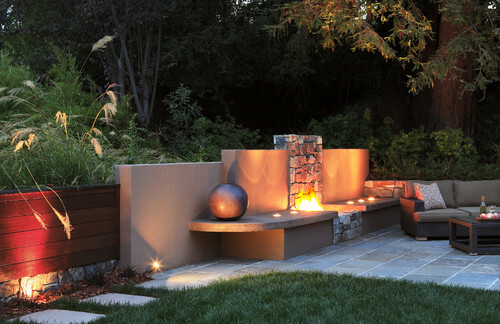 A short stacked stone wall runs the entire length of this garden but is intersected by rusted metal panels which form the framework for both the fire and water features. The repetition of these materials, together with the change in wall height where metal is used creates an interesting visual journey from one end of the garden to the other. These unusual panels were part of a drought tolerant garden at the Denver Botanic Garden. Mention the word screening and images of 8’ fences, groves of bamboo or rows of columnar evergreens usually comes to mind, but such dense screening isn’t always necessary or desirable. Such a uniform treatment can make the garden seem confined rather than cozy, especially if it is on the small side. This series of stone panels (or are they cleverly crafted stucco??) at the Denver Botanic Garden caught my eye recently. They are set some distance apart yet give a clear sense of definition while at least partially obscuring what lies beyond. These panels are softened with herbaceous plantings, their tan seed heads casting interesting winter silhouettes. This type of peek-a-boo design could be also achieved wood or metal. The panels could be solid or feature cutaway designs. Each section can be placed side by side, set at an angle, or be staggered forward and backward by a foot or so. The important thing is to establish a rhythm and a degree of transparency. By providing somewhere for the eye to stop in the ‘mid ground’ we prevent it from automatically focusing on the background, and sometimes that is all that is needed. This wall design was my inspiration for this entire post! My friend and author Debra Prinzing has discussed it in her latest article for Houzz; Ornament Your Garden The Artful Way. Form, function and artistic expression are equally represented in this imaginative retaining wall. 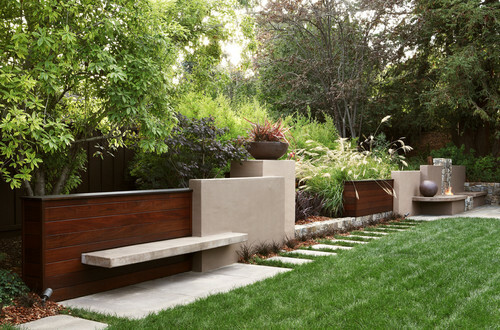 The wall itself spans the entire length of the garden, but instead of feeling like a barrier it is a focal point. Blending warm ipe wood, smooth stucco and rough stone creates an exciting textural tapestry. By overlapping rectangular panels and well-proportioned pillars the design becomes a three dimensional sculpture and allows for the incorporation of a seating bench and fire pit. A cutaway area reveals the garden beyond it but the two walls remain connected by a section of low profile stone. This was a key design decision as without that stone ledge the appearance would have been of two separate walls and the expansiveness of the design lost. This wall marks a transition from the cultivated lawn close to the house and the wilder plantings beyond, yet maintains a sense of continuum from one side of the garden to the other. The well placed bowl and sphere are perfect points of ornamentation both in scale and understated style. Before you erect another fence or plant another row of arborvitae take some time to consider how you can make the most out of the space. Maybe build an arbor into one section of a wooden fence? Or raised beds with deep capstones for seating which project from a stone wall? Perhaps at least staggering the placement of trees? Rather than just using one material what about combining two? Or using color to add punch to some areas? I’d love to see how you solve this design dilemma. Do email me photos of your projects and share your inspiration! Thanks for pointing out these unusual and creative design ideas. When is a wall more than a wall? If ever it should be in my garden! I have had dreams of a stone wall similar to your first photo for years. I even had a professional give me an estimate for building one, but the projected cost put a stop to the project. I have seriously considered building it myself, but I would want it to look fabulous. Still, dreams do sometimes come true, so I haven’t given up. Also, thanks for your suggestion about putting heuchera or carex by the rabbit in my woodland garden. I always appreciate advice, especially when it comes from such a gifted designer as yourself! I already have woodland phlox and Solomon’s Seal planted there, and I was planning to add some additional plants. I think your suggestion is great! Why does that budget keep putting a crimp in our creativity?! I love stone walls too but can’t see it ever being a possibility. I did wonder about using concrete block under a stucco type treatment and washing it with color but I’m not sure if I’m brave enough – yet! I would be worried about the block wall idea, unless you are sure as to how to build it so there will be no movement…so it will last forever. I worked in Germany for 5 years, and there it is important to consider the design of every square inch of the property.. When you don’t have much space to deal with, then every thing has to count. It is also important to remember that no matter which way you turn within the space, there has to be another vignette … think in terms of multi-functional. With these thoughts, the design will become a joy to put together. The small garden is the most fun to design.